We can perform radiography on any body system using high quality digital x-ray. Dr. Riehl is also certified in the PennHIP method to evaluate pets for canine hip dysplasia (CHD). Identifying CHD early in life can help us implement therapy to help slow progression of osteoarthritis that will develop over time. Please call us for more information. 760-736-3636. 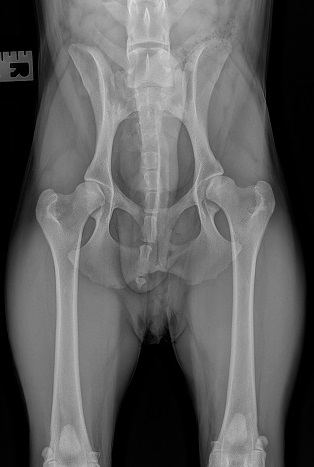 This is a radiograph from a 1 year old male neutered boxer that we evaluated for hip dysplasia.